Far Cry 4's map editor is a pretty flexible tool. While competitive maps aren't currently supported, you've plenty of options when in comes to challenge map creation. Here's the thing: I'm not a map maker. I'm an idiot. And so, when faced with an infinite world of possibilities, I went straight for the bears. For instance, what happens if you stack a bunch of bears on top of each other? You get a Bear Stack, obviously. The map editor's camera is a little awkward to use, hence why it's so lopsided. The smaller stack on the left was to test what would happen to a perfectly aligned column of bears. In other words, it's the control stack. This, clearly, wasn't working. Could it be that there were too many bears? I decided to redistribute my bears more evenly. 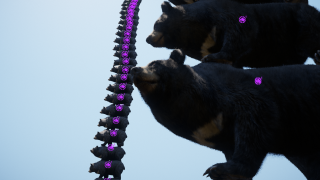 Bear Stack 2 was born. Yes, it's still a bit lopsided, but would you look at that bear latticing effect before it all comes crashing down! Unfortunately, the Bear Stack has little real-world application. What I needed was something more suited to the mountainous environment of the game. What I needed was the Bearvalanche. To be honest, this didn't work. Largely, I think, because of my inexperience with the editor. The bears are rooted to their steep incline: unable to roll from their position unless killed. This is not the avalanche as I intended. Is having a rolling cascade of bears pile on top of you really too much to ask? I hope not, because I'm determined to get this working.